I’d been wanting to make a sausage flavored with all the elements of the classic dish Duck a L’Orange for a while, and then I found myself in possession of 13 diver ducks: Goldeneyes, scaup, that sort of thing. These are fishy ducks, as they eat lots of clams and crustaceans and other fishy things. What to do? Skin them and make duck a l’orange sausages, of course! Even with this treatment you will want strong flavors to go with sea duck or diver duck meat, just in case you missed some fat along the way. Orange juice, zest and orange liqueur do a nice job of this, as do cloves, garlic and just a little cayenne. The result is a luxury link from a garbage duck. Roast or grill these sausages slowly and serve them with mashed potatoes, or toss them into cassoulet or some other hearty stew. Can you use other wild ducks, Canada or snow geese, or domestic ducks or geese? You bet. Cut the pork and duck into chunks of about 1-inch. In a small bowl, combine the cloves, black pepper and cayenne and sprinkle the seasoning mixture all over the meat. Refrigerate for 30 minutes. If you are making sausage links, take out your hog casings and soak them in warm water. You will need 10-15 feet of casing. Chill the bowl of a stand mixer and the meat grinder’s parts in the freezer. Set up the grinder with the coarse grinding plate; place the bowl below. Take the meat out of the fridge and mix in the salt and sugar. Turn your stand mixer onto medium speed (No. 4 on my Kitchenaid), and grind the meat. Put the ground meat in the freezer to keep it at 32 to 40°F. Clean up the grinder. Now take the meat out and add the orange zest, garlic, Grand Marnier and orange juice. Using clean hands or the paddle of the stand mixer, mix the meat until a sticky mass forms, about 90 seconds; be careful not to let the meat get too warm. Refrigerate for up to 3 hours. If you are not making links, you’re done. If you are making links, it’s time to flush your hog casings. Working over the sink, gently run warm water through each casing. Look for any spots that leak and cut out those portions. Set up the sausage stuffer and slip all but 6 inches of a casing onto the tube, leaving the trailing end untied. Tightly pack the sausage mixture into the canister. 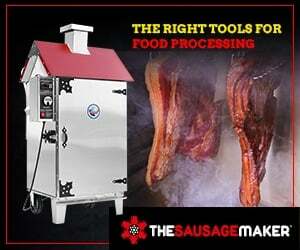 Start cranking the sausage stuffer very slowly until the meat emerges from the tube. Slowly crank the sausage into the casing, using your free hand to regulate how tightly the sausage is packed; make sure not to overstuff the casing. When the casing is nearly stuffed, tie off the end. Starting at one end, pinch off the first link by pinching your fingers around the sausage to separate the filling; 6 inches is a good average length. Then, roll the link toward you 3 to 5 times, creating a twist in the casing. Move down to form the next link, rolling 3 to 5 times in the opposite direction (this helps prevent unraveling). If the casing splits, remove the stuffing near the split and tie the casing closed before proceeding. Alternately, the links can be formed by sectioning them off with butcher’s twine. Repeat with the remaining casings and sausage. Hang the sausages on wooden or metal racks over paper towels to set up and dry. Sterilize a needle over a flame. Prick holes wherever you see air pockets in the links. 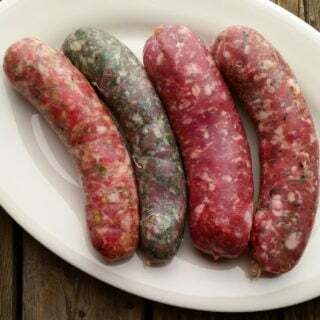 Let the sausages hang to dry for 1 to 2 hours and refrigerate overnight before cooking. You have some fantastic duck sausage recipes here but I’ve noticed that they all use pork fat. Why is this and why not duck fat? Andrew: Because duck fat is too soft. It will not work for regular sausages, only emulsified ones like hot dogs. Is there an alternative to the pork fat you suggest in your recipes or is any comparable fat suitable? Cost is not my consideration… I just don’t eat pork!! I have Muscovy ducks. Way too big and tough for roasting. I love these sausages. I’ve done the Hunter and Polish a few times with great success. This orange one was a trick shot for me, though. I didn’t have zest or grand Marnier, so I subbed Armenian apricot wine, candied orange peel and marmalade (good stuff. No corn syrup) added to the oj. I also cut the clove in half and added a gram of fresh cardamom. I dug out the center of a sweet potato and packed it with un-encased l’orange. Amazing. Thank you so much for these recipes. I’m having a lot of fun.